The Evo Motion Sofa with Power features a power headrest that lets you to adjust the upper back cushion for the perfect neck and head support. The Evo has a channel back, pad-over-pad arms and T-cushion fronts. Both ends recline with the touch of a stylish button that is on the side of the sofa. Featured in 100% top grain cowhide leather with vinyl on backs and sides in a gorgeous graphite color. The Club Level Evo Graphite Leather Power Reclining Sofa with Power Head & Footrests by Bassett at Great American Home Store in the Memphis, TN, Southaven, MS area. Product availability may vary. Contact us for the most current availability on this product. Recliner Mechanism Power: Ease of activation with infinite position operational the touch of a button. Power headrests & footrests. Frame Construction Frame Materials: Leggett & Platt EZ-350 mechanism with wood seat box, high-density foam seat cushions, sinuous wire seating, solid foam arms, padded outside sides and backs, removable backs with blown fiber in muslin bag. The Club Level Evo reclining group will be a comfortable yet classy addition to your large family room. With room for everyone to spend quality time together, use this collection to create a space where everyone feels welcome. 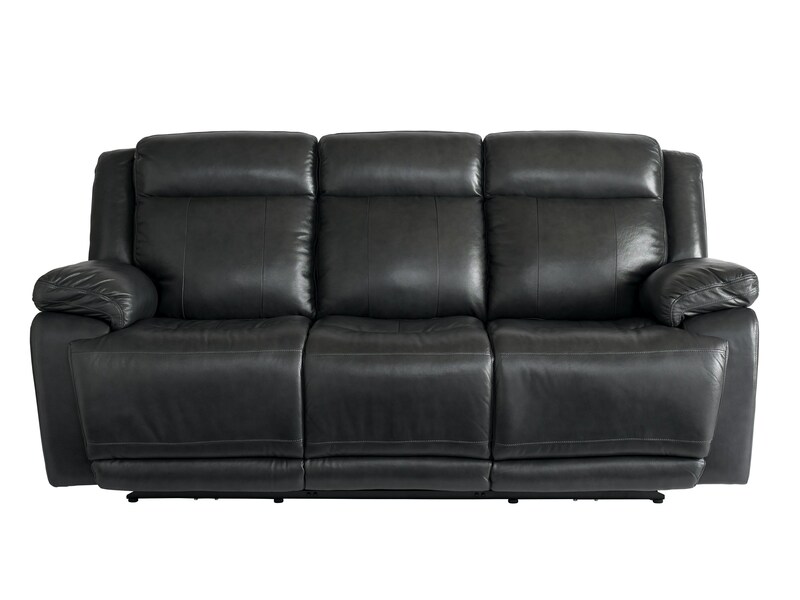 The dark leather upholstery is stylish and easy to match with other pieces as well as decor. All reclining mechanisms are full power, allowing you to recline at the touch of a button. The two end recliners on the sofa & loveseat also feature power headrests, to make it easier to watch TV while reclining. Both end recliners also feature USB chargers for your mobile devices. The frame and upholstery are made with high quality Bassett construction techniques, which means this investment will last. Update your home with this handsome reclining collection. The Club Level Evo collection is a great option if you are looking for Casual furniture in the Memphis, TN, Southaven, MS area. Browse other items in the Club Level Evo collection from Great American Home Store in the Memphis, TN, Southaven, MS area.